There is no shortage of dessert options on Cook with Sara. I've got all the carbs covered from A to Z, bars to tiramisu. (That's only B to T, but pretty close) As we continue our Countdown (thanks to Sarah at Fantastical Sharing for hosting! ), my mouth is watering remembering these delectable treats. I love making fruit crisps and I have used the same basic recipe for many years. When I stumbled across this variation, I knew I had to try it. I think I made it 3 or 4 times this fall, all to spectacular acclaim! Can you say RICH? These bars meet that definition - be sure to cut them small! 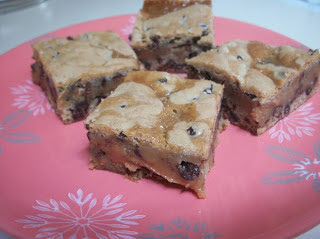 These bars disappeared quickly at a pool party and I had several requests for the recipe. And it's no surprise why - a blondie swirled with pb and caramel and studded with chocolate chips is sure to be a hit anytime, anywhere! This dessert is simply amazing. It was such a hit at our house that the teenager requested it for his birthday "cake." Although it's great served cold from the refrigerator, we liked it best when it was slightly frozen. Peanut butter, caramel and chocolate chips followed by caramel and banana tiramisu...I think I must be in Heaven. 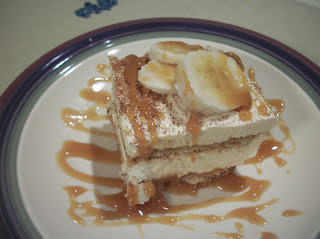 I need to make your Caramel Banana Tiramisu, even if it's only for the caramel. 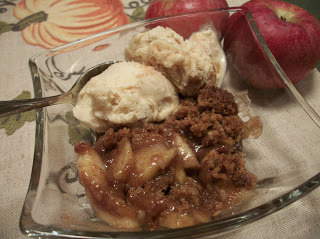 That gingersnap apple crisp sounds quite tasty. 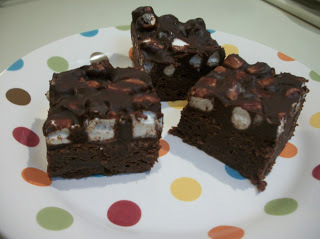 Hello, Mississippi Mud Bars, let's be best friends!